“Who would leave the sea and build his house in the desert?” is the question posed by Hussain, lifelong friend of Mohammed, the main character in “The Good Omen” (Al Bishara), a short-film from Bahrain by director Mohammed Rashed Bu Ali and one of the first internationally screened films, produced in the tiny island-kingdom. The question is asked while the two men navigate the tranquil sea of the Arabian Gulf on a traditional fishermen boat and behind them stands in the background the bridge between Muharraq Island and the main Bahrain Island as a highway from the once modest fishing and pearl diving village, into the skyline of the now modern state. “The Good Omen” (2009) rescues with minimal resources – technical and aesthetic – the traditional life in the island of Muharraq alongside the conditions furnished by the nascent state, rather than before, as it happens to be the case in some of the region’s films. “Traditional” is not only a strong word but the key word in cinema from the Arabian Gulf, and from the greater Middle East in general, where the questions posed by tradition – in both content and form – have become a battleground where a plethora of social, ethnic and cultural conflicts are meant to be solved by means of aesthetic responses often loaded with critical but ambiguous messages. This strategy, albeit proven successful in films since the rise of social realism in film – coeval with the social revolutions of the 20th century and responding to the radical aestheticism and one could say, Romanticism, of a great deal of early 20th century art, has done an enormous injustice to the potential of film as an art form and belongs in the primitive materialism of the 19th century, to use the expression coined by Maya Deren. “Tradition” films – though not recognized yet as a genre – are not exclusive to the Arab world, and have been very popular in Chinese and Latin American cinema too, but they do account for a great number of the films produced in the region. The very fact that tradition is the most commonly addressed topic in Arab films indicates only that tradition has become significantly weak or at the very least, is being contested in the mind of the artists. The early history of Arab cinema – going to back to Egypt’s “Layla” from 1927 and Lebanon’s “The Adventures of Elias Mabruk” from 1929 – tells us that Arab filmmakers were interested in the radical aestheticism of American films and the films themselves presented conditions and situations of the time rather than questions and challenges. This was more or less the driving force behind Arab cinema and was maintained throughout the golden periods of Egyptian and Lebanese cinema, until its demise and decline in the 1970’s that coincided with the Lebanese civil war and the beginning of Hosni Mubarak’s rule in Egypt. In this period, cinema in the region entered a comatose period after which it never recovered and it was out of this predicament that the new – independent – Arab cinema was born. The idea of “tradition” films is highly paradoxical: The resources made available by the modern era to cinema – the quintessential modern art form – are put at the service of delivering modernity an acute visual and thematic critique. The movement however is not entirely undialectical: Disappointment with and criticism of the modern world are part of its dynamics and survival. Embedded in “realism” – both the poetic realism of France and the neorealism of Italy – these films are understood as a practice and extension of reality, out of which the so-called “Third Cinema” – opposed to both Hollywood and avant-garde or art film – was born. Primarily a Latin American movement from the 1960’s, it was a manifesto against bourgeois values and individualism. “Third Cinema” rejected the idea of cinema as an instrument for personal expression and appeal to the masses, presenting the “truth” in order to inspire political activism. As an art form, it eventually became the normative format of the documentary that followed modes imported from prose narrative, identical in their primitive materialism to Hollywood films in being enslaved to the linear sequence of the realist novel and the play. Tradition film retained the aesthetic social realism of the documentary but rejected the idea – strongly Marxist – of collectivism and this gave way to richer layers of composition and cutting in which elements of literary modernism crept it: the stream of consciousness, the interrupted narrative and the psychological description. It is in this sense that Bu Ali’s film “The Good Omen” can hardly the classified as “tradition” not because it has not made use of the advantages and resources of tradition films but because it has expanded the narrative possibilities of film beyond the linear plot and has introduced poetic elements at all levels of expression: filmic, aesthetic, conceptual and narrative. The difference between prose and poetry in films is not one of content or even narration but an index of temporality: In prose events unfold horizontally whereas in poetry they are superimposed vertically on top of one another, not in order to present a logical sequence of events but to represent a condition, rather than a situation. The only predecessors in the region to Bu Ali’s styles of films could be Bader Ben Hirsi’s “A New Day in Old Sana’a” (2005) that was described by a critics as a piece of magic realism, but that still in comparison would lack to poetic visions and the abstract quality of the Bahraini director’s films. 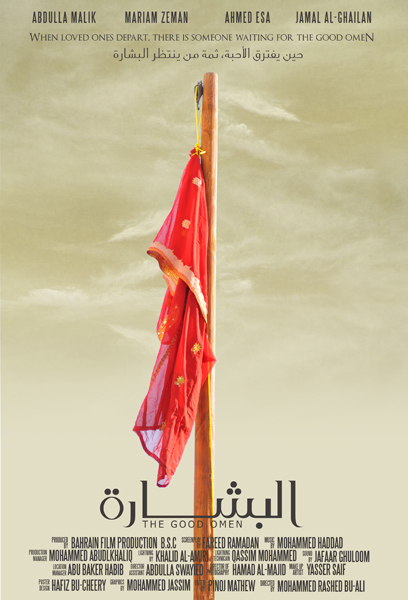 The poetic impetus of “The Good Omen”, where it defeats tradition films is in picking the good omen from Bahraini culture; the act of hanging the traditional and highly elaborate woman’s dress – known as thobe al-nashal – over the roof of one’s home as a joyous announcement of the return of a family member after a long absence. Mohammed, the protagonist and an archetype for the human condition of loneliness rather than merely a fictional character, is awaiting his long-departed wife and from whom he refuses to part, even though the news of her death is no longer news. He refuses not only to cross the bridge into the main island but also to settle into the conditions of modern life – for example, by going to live with his son in a modern house – and clings to the constricted space that can keep alive the memory of the dead wife, rather than dilute it. The condition of loneliness presented in the film isn’t that of modern alienation – as for example in “Mirrors of Silence”, a short film of Emirati director Nawaf Al Jahani – but something a lot more essential: The loneliness portrayed by Bu Ali isn’t a form of temporary depression or mere sadness but rather a permanent mental condition in which the characters are unable to relate to the world in its current form and need to circumvent it through establishing inner worlds of language. His previous films “Absence” (2008) and “Canary” (2010) can be said to form a thematic trilogy with “The Good Omen”, even though they offer different visions and perspectives. “Absence” (with a reference to “The Lonely Alone” of celebrated Bahraini poet Qassim Haddad and partially set to the famous piece “Fat Al Mi3ad” of classical singer Um Kalthoum) offers a singular meditation on loneliness from the perspective of the Arabic tradition of hospitality – a guest that never arrives. The trope is traditional but the condition is modern; the guest that never arrives provides a Messianic interlude that runs throughout the whole of modernist literature. A similar feature of fulfillment or hope beyond hope can be found as well in the development and end of “The Good Omen”. “Canary” on the other hand puts the stress on the idea of loneliness as a permanent mental condition and a form of insanity that had been expressed in “The Good Omen” but in a far radical manner. It is not only that the protagonist – and owner of the canary – expresses his self-exclusion from the world by holding lengthy phone conversations with a friend through a phone whose wires are cut but also that the rest of the characters – a blind girl and a mute man – through whom the canary is passed, are just as unable to communicate with the world through normal channels; it is not only a question of a debacle. The break with the genre of tradition film and authenticity of Bu Ali’s productions also surfaces with the scores of the film that are nowhere improvised or realistic but carefully chosen pieces of Mohammed Haddad, the greatest composer and music critic from Bahrain and himself the son of the poet Qassim Haddad. The classical pieces – although in “The Good Omen” there is traditional Bahraini music, in the tradition of the Fidjeri – heighten the poetic revelation of the films and render the stories being told less relevant than the conditions they represent. In “The Good Omen” there is the added element of a narrator voice – what does not weaken the other two films, it only makes the spectator experience them as more abstract pieces – and sung music that set the space for some kind of orality, in tune with the creative use of local traditions, that is for the most part absent from contemporary cinema and that abstracts the cinematic realism of the film into a composite space between pure storytelling and pure art. If anything, the films of Bu Ali perform for the culture of Bahrain and the Arabian Gulf what Costumbrismo did in the painting and literature of the Hispanic 19th century: Literary and pictorial – in this case narrative and visual – interpretation of local everyday life, mannerisms and customs. Bu Ali seems himself primarily as a storyteller rather than a producer, writer and director; writing today – even from a theoretical perspective – encompasses a vast range of media and techniques, not all of which are served by the established genres of literature. While seeing films as an alternative to literature does great injustice to films as mere entertainment or ersatz literature, his films – unlike tradition films – do constitute literary achievements. Like most of the directors from the region, he is self-taught and does not come from an art school background but that has not kept him from acquiring the skills and especially the acute understanding of the concepts at work in contemporary film, and even of taking some of them one step beyond the established canons of the time, looking at great things people did in the past and envisioning great things people will do in the future. His films were screened yesterday in Bahrain at the creative art space Alwan 338 in Adliya, in collaboration with Al Riwaq Art Space, in great anticipation to this participation in the 5th Gulf Film Festival where his new film “Huna London” is going to be premiered on April 12. Even though Bahrain has not been on the agenda of film critics and aficionados even in the Arab world, the country remains a pioneer in the Arabian Gulf, producing films since 1990 with a good number of directors, of which Bu Ali is among the youngest and most active.